The latest-generation Porsche 911 offers ZF Friedrichshafen AG's fast-shifting dual-clutch transmission as an option. The system helps improve the sport car's acceleration by enabling smooth gear changes with no power flow interruption. In addition, when paired with the 3.8-liter engine in the Carrera S, the dual clutch helps achieve a 14 percent reduction in fuel consumption compared with the previous-generation 911. ZF also supplies the 911 with various electronic and chassis components as well as the clutch for the seven-speed manual transmission. 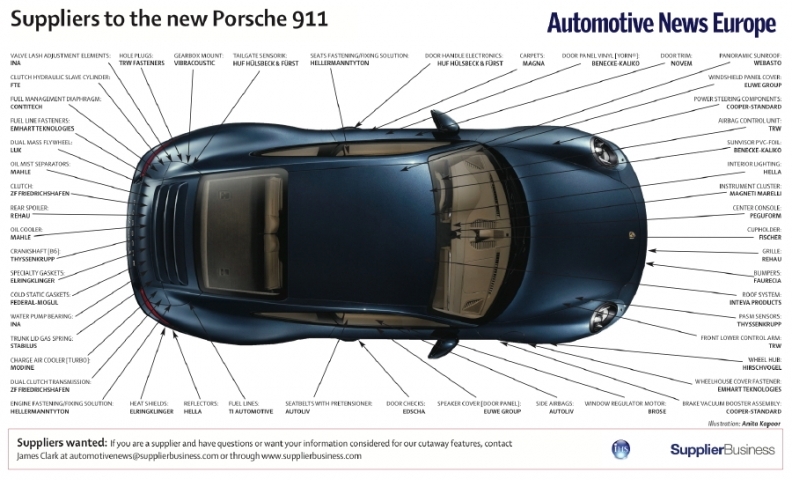 On the inside, Porsche has redesigned the interior of the new 911 with an eye toward the Carrera GT supercar. The 911's new center console from Peguform Group helps make the driver more closely integrated with the cockpit. This happens because the center console is raised up to the front with the high-mounted gearshift lever or dual-clutch gear selector located especially close to the steering wheel. Peguform also supplies the interior of the new model with its door panels and the instrument panel.